"Tourists wandering around Recife should be particularly careful with their possessions and it's best, too, to use taxis to get home after an evening out. Recife is one of Brazil's most violent cities, an unsurprising statistic given the immediately obvious disparity of wealth and stark poverty, and the large number of homeless people on the streets. On Sundays in the old centre of Recife, the streets often seem deserted except for beggars; everyone else seems to be on the beach at Boa Viagem. Tourists tend to hang out in the much pleasanter environment of laid-back Olinda." (82°F) and 34°C. Heavy rains make daily visits during the main winter months of June and July, and the heat reaches its peak from mid-December to February, when locals typically go on vacation. The most pleasant months are March through June; it's warm but not as hot as in December through February. - There are also important historical locations around Recife in Igarassu (19 miles from Recife) and Jaboatão (10 miles from Recife). The latter was the site of the Battle of Guararapes, when the Dutch were driven from Pernambuco. Nossa Senhora dos Prazeres Church marks the spot where the 30-year occupation was ended. The sertão of Pernambuco is known as a dangerous zone. The region is sparsely populated and official authorites have a limited presence. Despite frequent police raids, plantations of marijuana are found often (consequence of the lack of alternatives of the local peasants). Buses go in convoys, usually with police escorting; avoid driving around this region. Recife is the Northeast's 4th most visited city behind Salvador , Natal and Forteleza. It is best known as the third great Carnaval center of Brazil (after Salvdor & Rio) with its own much loved traditions of folklore and music. It is famous for the music known as frevo, maracatu and xaxad. Besides a strong arts and crafts tradition, its folklore celebrations known as reisado, bumba-meu-boi and xango are especially noteworthy. Recife considers itself a cosmopolitan city, and while most visitors enjoy the stress free infrastructure that the beachfront hotels of Boa Viagem offer, they will be rewarded by planning trips to enjoy the many historic sights and cultural attractions the city offers. Beginning with its split from Olinda in 1710, Recife's three original islands, joined by many bridges, served as Brazil's most important port for many years. The influence of the 30-year Dutch invasion, which began in 1630, is still quite visible. The delta of the Capibaribe and Beberibe rivers adds much shoreline to the Northeast's most important industrial and commercial City. Recife is Brazil's sixth largest City, with almost 3 million residents in the metro area, and competes with Salvador as the most influential center of Brazilian culture. Saturated with traffic-filled narrow streets, ancient churches and many large office and government buildings, Santo Antônio is the most historic island and the main commercial center. Boa Vista includes both residential quarters and a commercial section where one can find reasonably priced hotels and entertainment establishments. The busy docks of Recife Island have been infused with new life by a major government restoration area, and it has moved beyond its seedy past to be able to claim the best nightlife anywhere outside of the beach boulevard of Boa Viagem. Recife, like Salvador, was once a center for the slave trade, where millions of Africans were sold to the owners of the sugar-cane fields. The Portuguese, like the Spaniards, left their women in the old country. Unlike the Spaniards, they were much more likely to couple with the locals. The miscegenation is readily evident among the natives today. Most of the population does not work in the visitor industry, but rather in importing and exporting, sugar refining, cotton milling, iron working, pineapple canning, tomato preserving, and the manufacturing of cement, asbestos, paper, roofing, and leather goods. Avenida Dantas Barreto splits the island of Santo Antônio, home to the central business district and many surviving colonial churches. Just over the river is Boa Vista, linked to Santo Antônio by a series of small bridges; the brightly painted criss-cross girders of the Ponte de Boa Vista are a convenient central landmark. Santo Antônio and Boa Vista are the dirtiest areas of Recife, and although they bustle with activity during the day they empty at night, when the enormous, largely deserted streets are a little spooky and forbidding. Residential suburbs stretch to the north, but the bulk of the middle-class population is concentrated to the south, in a long ribbon development along the beach at Boa Viagem. Boa Viagem is the most popular beach, and while calling it the Copacabana of the Northeast should be taken with the same grain of salt as calling Recife the Venice of Brazil, there is no denying the broad appeal to the thousands who regularly gather on its wide sandy beaches that stretch for 8 km (5 mi). The longest stretch of urbanized seafront in Brazil, its long coastal reef calms the waves and helps keep the water a comfortable 25° C year-round. Here is where nearly all of Recife's best hotels are located, as well as many outdoor cafés, restaurants and a lively night club scene. This district, home to the upper-middle class, acts as the center of the city's social life. Every night, Boa Viagem beach is lit up, allowing bathers to swim at night and attracting many young people. The hotels can fill up during the summer months from December to March. 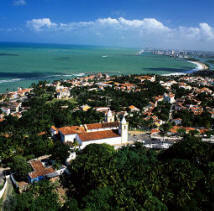 Olinda is a small, charming town only 7km from Recife. Olinda has an amazing number of well-preserved historic buildings built on a hillside with stunning vistas. The smaller-sized accommodations provide a nice alternative to Recife. Olinda's inhabitants are a merry, creative, hospitable and communicative people. The elevated old town is a centre of popular and classic artists and craftsmen focusing on music, folklore, dance and crafts. There is a wide range of restaurants offering the local fare, which has a reputation for good seafood and tropical fruits. Olinda was declared a World Monument by Unesco, and is considered to be the birthplace of sixteenth century Brazilian culture. There are twenty churches in the UNESCO Heritage City. The old colonial centre is built on the hills, slightly back from the sea. Spreading inland behind the old town is a modern Brazilian city of over 300,000 people - known as Novo Olinda, it is now very much a part of the Recife metro area. Olinda's hills are steep, and you'll be best rewarded by taking a leisurely stroll around the town. A good spot to have a drink and plan your attack is the Alto da Sé, the highest square in the town, not least because of the stunning view of Recife's skyscrapers shimmering in the distance, framed in the foreground by the church towers, gardens and palm trees of Olinda. There's always an arts and crafts market going on here during the day, peaking in the late afternoon. A leading beach resort and art center in an area of sugar plantations, the city has sugar-processing and cigar-and textile-manufacturing industries. Olinda's many churches indicate its prominence in early colonial history. The monasteries of São Francisco and São Bento have art collections, and the regional museum, state museum, and sugar museum are of interest. Also in the city are the fort of São Francisco, called the Cheese Fort; the Prefeitura, or government house of the captains general; and the Joaquim Nabuco Institute. Location: about 7 miles (12km) south of the city center and just a few kilometers from the beachside hotels in the neighborhood of Boa Viagem. Taxi to Boa Viagem costs R$8 to R$12 and to Olinda R$30 to R$45 (US$15 to US$22.50). BUS: Boa Viagem, the regular airport bus, no. 33 or no. 42, leaves every 15 minutes and passes within 1 block of most hotels along the beach; the fare is R$1 (US 50¢). From the airport, it's easy to reach the highway BR-101, which leads to Porto de Galinhas and the other beaches southern of Recife For visitors staying in Boa Viagem, the airport is only 2km away. Buses are the primary form of long-distance transport for most Brazilians, and services are generally both excellent and inexpensive, with all major cities linked by frequent buses. Renting a car is an option although it is often advised against for general exploration. For Pernambuco, there are many cautions against going without a caravan too deep into the interior's sertao. The best information booth is the one at Praça Boa Viagem, open daily from 8am to 8pm (tel. 081/3462-4960 or 081/3341-6090). The staff is helpful and will provide an excellent free map of Recife and some good general information. The state tourist office, EMPETUR, runs a 24-hour information post at the airport (tel 081/3341-5707), where you may find English-speaking staff. tourist hotline: just ring 1516 (Mon–Fri 8am–6pm) and you should be able to find someone who speaks English. In Olinda, the tourist information office is located inside the craft market Mercado da Ribeira, Rua Bernardo Vieira de Melo s/n (tel. 081/3489-1660 or 081/3429-1927), open daily from 9am to 6pm. There is also a kiosk at the Praça do Carmo, where the buses from Recife arrive. Roads, ports, airports. Notice that some links are clickeable. 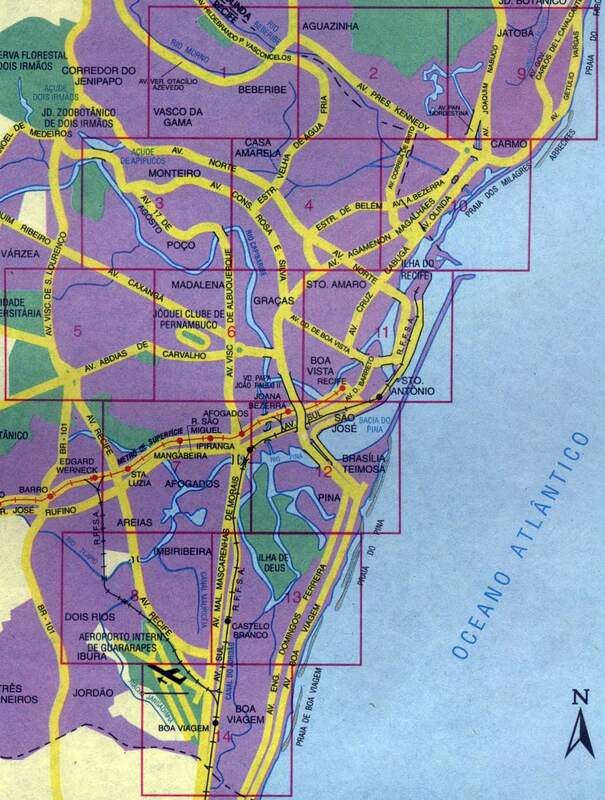 Conditions of federal roads in Pernambuco. Up to date info. Click on the name of the road to read details about it. 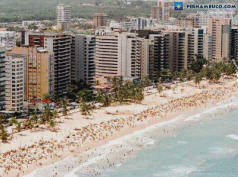 The Boa Viagem Beach area has the largest concentration of hotels. It is 10 Minutes From Old Recife, five minutes from the Guararapes Internacional Airport, 15 minutes from the commercial and financial district and 20 Minutes From Olinda (remember to negotiate $ for the cab in advance). There is not a good hotel district in downtown Recife where it is safe to walk alone at night. Do consider some of the more modest accommodations available in the World Heritage City of Olinda. Take your bearings from one of the three main roads: the seafront Avenida Boa Viagem, with the highrise hotels and promenade of palm trees and mosaic pavements; the broad Avenida Conselheiro Aguiar two blocks up; and then Avenida Engenheiro Domingos Ferreira. The Metrô The first metro line was built in the early 1980's to relieve the city from increasing traffic problems and pollution. It runs mostly above ground along a former railway alignment from the city centre in the east towards the western suburbs and the bus station Rodoviária. An extension from Rodoviária to Timbi Camaragibe, a town of almost 200,000 inhabitants and 4.5 km away, opened in December 2002. The current length of the network is 25 km with 18 stations. The metro carries some 120,000 passengers a day. Another line which will cover the Boa Viagem area is under construction. This line will have stations at several points of Boa Viagem, including the Shopping Center Recife and the airport. This line is partially open and due to be completed in 2007. Praça da Independência: Where most city buses originate and terminate on the central island of Santo Antônio, on Avenida Dantas Barreto, and either side of the Pracinha do Diário. Avenida Guararapes outside the main post office is also an important hub. Olinda from central Recife: walk south down Avenida Dantas Barreto from the Pracinha do Diário to the last of the series of bus stops, and catch the bus marked “Casa Caiada” – you’ll think you’re heading in the wrong direction at first, but you will get there eventually. From Boa Viagem: most buses in either direction can be caught on Avenida Engenheiro Domingos Ferreira, three blocks in from the sea. Buses marked “Dantas Barreto” will get you to the city centre, and so should most of those marked “Conde de Boa Vista”, though it’s probably best to ask. Boa Viagem to Olinda: get on buses marked “Rio Doce”. Taxi: In Recife it is best, to use taxis to get home after an evening out and avoid the large homeless population. A taxi from central Recife to Olinda should cost around $8–10 and will take about fifteen minutes; ask for a quote before you get into the cab as a usual precaution against being burned as a tourist. There are hundreds of restaurants to choose from; with a multitude of cuisines that include: Indian, Arabic, Italian, Seafood and Japanese. Lots of fresh fish is available including the sea shore vendors particularly feature the fried fish, called "agulha"
Eating out is cheapest in Santo Antônio, and more expensive in Recife island and Boa Viagem, with Olinda somewhere in between. Fresh seafood, shellfish and local fruits are popular. Try carangueijo mole, crabs cooked in a spicy sauce until shells and legs are soft and edible, which solves the problem of digging out the meat; small crabs called guaiamum; and agulhas fritas, fried needle fish. Also enjoy the grilled meats, including goat, which are found in many restaurants. As you walk past the cafes of the aroma of coffees and deserts draws you inside. Try Brazilian espresso and a desert called Cartola. Cartola, is bananas fried in butter, topped with melted cheese and then sprinkled with cinnamon & raw sugar...just try it. Fresh coconut is available everywhere and many dishes come with a delicious coconut sauce. As befits a sugar city, a favorite local drink is caldo de cana, which is pressed on the street as part of a thriving street vendor scene. Drink some of this juice of sugarcane juice and you can feel the jolt; which offers you your best values. Recife island has plenty of restaurants, and you may want to eat there as a prelude to going on to a bar or a nightclub. But prices are relatively high and the emphasis is on sophistication rather than good old-fashioned hearty Brazilian cooking. Buon Gustaio, on Rua do Bom Jesus, does superb Italian food, and Gambrinus, at Rua Marquês de Olinda 263, is one of the places where you can get some local dishes. There's also a branch of the vegetarian restaurant, O Vegetal, on Rua do Brum (lunchtime only). While in there, don't forget to eat at Café São Brás; they serve the most delicious curaus, tapiocas, corn soups, etc. They have several locations around town. The shopping is also home to Recife's most sophisticated restaurant, Assucar. Down on the beach there are hundreds of places to eat, with one of the biggest concentrations in the Pina district, between the city centre and Boa Viagem. Catch a bus in the direction of Boa Viagem and get off on Avenida Herculano Bandeira, which is just where the bus veers round to run parallel to the sea. Almost the whole of the avenida is taken up with restaurants, most of them concentrating on seafood; especially recommended are Marinho's and Pra Vocês. In Boa Viagem itself the best value is to be found at the seafood places on the promenade near the city-centre end of the beach, and in the dining rooms of the cheaper hotels, all of which are open to non-residents. O Lacador - (Rua Visconde de Jequitinhonha, 138) The most affordable churrasco buffet in Recife. & Dao Joao - (Rua do Apolo, 134) - Portuguese food. Recife: Recife Antigo or the historic downtown has undergone a complete face-lift, becoming a cultural and entertainment district. The activities center around the Rua do Bom Jesus; lined with more than 15 bars and restaurants, making it a great option any night of the week. Polo Pina - A popular nightlife spot with many bars and restaurants. Fashion Club, Av. Marques de Olinda 133, Old Recife (tel. 081/3424-0033; www.fashionclub.com.br). Two dance floors and three bars still can't hold everyone on Friday and Saturday nights. Cravo e Canela - (Rua das Creoulas 260), a sophisticated and relaxed bar. New Hits - (Rua Gervasio Fioravante 111), a very happening dance club. Olinda is not known for its nightlife, but is a popular place for quiet romantic dinners. The Uruguay Club, Av. Prudente de Morais 281 (tel. 081/3439-8552), bar & restaurant with live classical, jazz, and blues Monday through Saturday. Butterfly, Rua Raul Azevedo 165, in Boa Viagem (tel. 081/3465-8073), male gay dance club with drag queen and transvestite performances; Thursday through Sunday after 9:30pm on. Crazy Dance Club in Olinda, Rua do Amparo 27 (tel. 081/3429-3953), open Thursday through Sunday after 9pm. Find karaoke, go-go dancers, and a small dance floor. Casa da Cultura de Recife (Recife Cultural Center), Rua Floriano Peixoto s/n, across from the metro station (tel. 081/3224-2850) was once a prison, but now the top regional craft center in the northeast of Brazil for handicrafts which make the best souvenirs. Livraria Cultura on the riverbank, is an excellent bookstore. It's next to the gorgeous Paço Alfândega Shopping, an eighteenth-century convent that later served as the Custom House. Mercado São José, across the river from Recife Antigo, is a fun place to for clever jewelry, and palm fronds used to make all manner of objects. Santo Antônio: Recife's downtown neighborhood around the Pátio São Pedro and in between Avenida N.S. do Carmo and Rua Primeiro de Março is jammed with small stall vendors. R. Av.Barreto de Menezes, 800, Jaboatão dos Guararapes. Phone: (81) 3464-2211 (www.shopping-guararapes.com.br). R. Padre Carapuceiro, 777, Boa Viagem, Recife. Phone: (81) 3464-6123 Brazil's second largest shopping center. (www.shopping-recife.com.br), all buses heading downtown stop here. Olinda's several markets and endless artesanato shops make it a good place for shopping. There are two standouts. Mercado da Ribeira, built in the sixteenth century, is at Rua Bernardo Vieira de Melo 160, s/n (tel. 081/3439-1660), which is open daily from 9am to 6pm. and offers the usual range of craft goods, while a ten-minute walk Mercado Eufrasio Barbosa [at Sigismundo Gonçalves s/n (tel. 081/3439-1415) also called Mercado Varadouro] a bigger artesanato and antique market housed in the long pink building which is the former customs house by the main road where you can find religious arts, paintings, woodcarvings, and regional crafts. American Express There is no American Express office in Recife. Area Codes The area code for Recife and Olinda is 081. Banks Banco do Brasil: in Recife -- Rua Barão De Souza Leão 440, Boa Viagem (tel. 081/3462-3777); in Olinda -- Av. Getulio Vargas 1470, Bairro Novo (tel. 081/3439-1344). Car Rentals Avis (tel. 0800/118-066 or 081/3462-5069); Localiza (tel. 0800/312-121 or 081/3341-2082); Unidas (tel. 0800/121-121 or 081/3461-4661). Consulates United States, Rua Gonçalves Maia 163, Boa Vista (tel. 081/3421-2441); Great Britain (Honorary), Av. Domingos Ferreira 4150, Boa Viagem (tel. 081/3465-0230). Emergencies Dial 190 for police, 193 for fire department and ambulance. The Tourist Police station is at the airport at Praça Min. Salgado Filho s/n (tel. 081/3326-9603). Hospitals Centro Hospitalar Albert Sabin, Rua Senador José Henrique 141, Ilha do Leite (tel. 081/3421-5411). Visa Renewal If you need to extend your visa go to the Policia Federal, Cais do Apolo 321, Bairro do Recife (tel. 081/3425-4026). The fee is R$63 (US$21). You may need to show both a return ticket and evidence of sufficient funds to cover the remainder of your stay.